International Plant Nutrition Institute, Australia & New Zealand. Rising atmospheric carbon dioxide concentration will result in drier and warmer conditions across much of the mid-latitudes, including Australia and New Zealand. 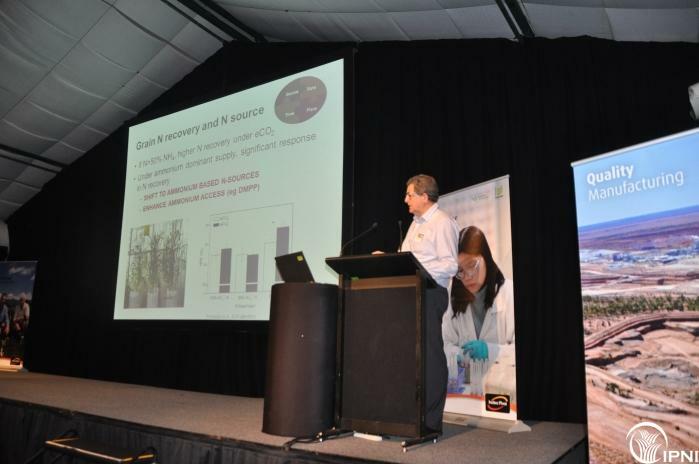 Research at the Australian Grains Free Air Carbon Dioxide facility has shown that although yield increased due to improved C supply, wheat grain protein, baking quality and important micronutrients all decline. Atmospheric carbon dioxide (CO2) has been rising since the industrial revolution, and at the present rate will reach about 550 μmol mol-1 by 2050. This increase, along with the consequent perturbations of climate will profoundly influence food production and farming systems. Higher CO2 levels are generally reported to stimulate growth in C3 plants. Uncertainty about how this increase would interact with hotter and drier growing conditions led to the establishment of the Australian Grains Free Air Carbon Dioxide Enrichment (AGFACE) facility in 2007. We provide an overview of the results from the AGFACE research group relating to wheat crop nutrition. The AGFACE facility is at Horsham (36.7519oS, 142.1144oE) in southeastern Australia. The facility has 8 elevated CO2 FACE rings (~550 μmol mol-1) and 8 control (~385 μmol mol-1) rings with 12 m rings and 12 plots each 4 m by 1.7 m per ring (2007/2008) or 16 m rings wth 24 plots (after 2009). These main CO2 effects are combined with different water supply (by irrigation), temperature during grain fill (by altering sowing time), nitrogen (by fertilizer) and cultivar. CO2 was injected over the crop in open-air rings from emergence until maturity in 2007, 2008 and 2009 (Mollah et al. 2009). Growth, yield, water use, grain mineral content and yield have been measured for each of the treatments and these data analysed as a factorial analysis of variance. Elevated CO2 did not affect the efficiency at accessing fertilizer N, and in the AGFACE there was no evidence of differences in N mineralisation from crop residues (Lam et al. 2012a). Nitrogen fixation efficiency was not affected by eCO2, but legume growth stimulation meant that more N was derived from biological N fixation under elevated CO2 This response was dependant on an adequate P supply to the legume (Lam et al. 2012b). The relative value of legume derived N to subsequent cereals may be reduced under elevated CO2. However, compared to N fertilizer application, legume incorporation will be more beneficial to grain yield and N supply to subsequent cereals under future climates (Lam et al. 2013). There is no evidence that crops grown under eCO2 have a higher efficiency of P uptake or access to different soil P pools (Jin et al. 2013a). This was despite more microbial activity around the roots of plants under eCO2, probably due to increased production of root exudates (Jin et al. 2013b). 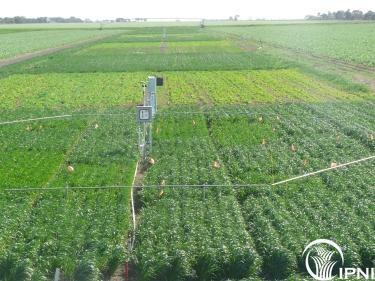 This research identified that nutrient management strategies will need review under elevated CO2. The pattern of growth, and therefore the temporal pattern of nutrient demand mean new combinations of the nutrient source, rate, time, and place will be needed, along with more efficient cultivars. Most important will be development of strategies to stop protein changes and so maximize the benefits of the extra carbon available. This may be by changing to ammonium based N sources, use of foliar N around grain filling and by building on the current research that is developing more N efficient cultivars. Jin, J. et al. (2013a) Plant and Soil, August 2013, published on-line. Jin, J. et al. (2013b) Plant Soil, 368, 315-328. Lam, S.K., et al. (2012b) Crop Pasture Sci. 63, 53-62. Mollah, M. et al. (2009) Crop Pasture Sci. 60 (8), 697-707. Nuttall, J. et al. (2012) Crop Pasture Sci. 63:595-605. Thilakarathne, L., et al. (2013) Funct. Plant Biol. 40, 185-194.